It is now well known that traditional actively-managed funds don't consistently outperform their index. As a result, investors have shifted hundreds of billions of dollars to index-tracking funds managed by companies including Vanguard, Schwab, and Blackrock (iShares). They're willing to accept the returns of the index minus 0.1%, 0.2%, or 0.3% (depending on the index) in fund expenses because even that is better than the -1% or -2% per year that active funds underperform. One company has achieved different results. 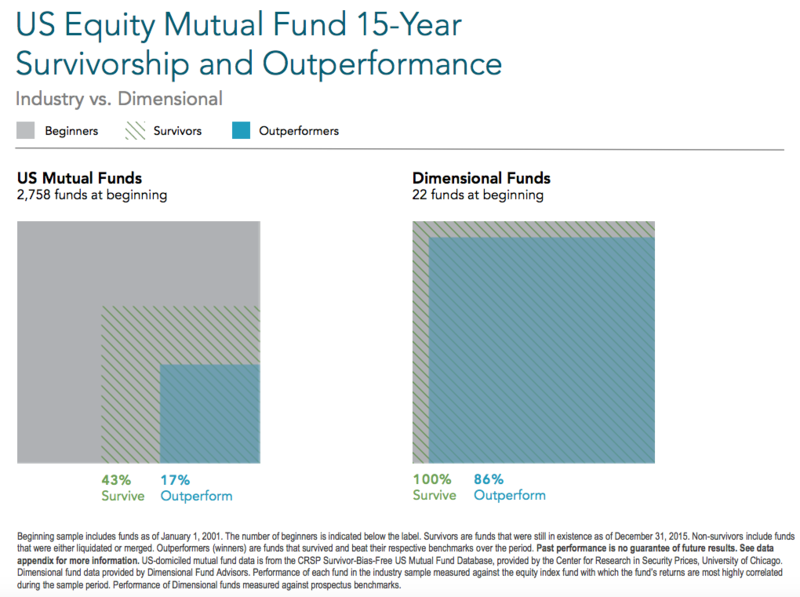 Dimensional Fund Advisors (DFA) manages index-like "asset class" mutual funds that target most of the stocks in the index, but emphasize higher-expected returning small cap, value, and (more recently) stocks with higher relative profitability. Unlike index funds that update their portfolios mechanically just once or twice a year based on the guidance of a 3rd party index provider like S&P or MSCI, DFA designs their own private indexes and uses natural portfolio cash inflows/outflows to refresh the underlying holdings according to these indexes on a regular basis, keeping their strategies more precisely focused on the overall asset class. As the graphic above illustrates, this process has resulted in index-beating returns (net of fees) for almost every single DFA stock fund over the last 15 years. It's a process and track record that is the envy of the entire investment management industry. As an advisor with a fiduciary responsibility to our clients to put their best interests first, Servo uses DFA funds in constructing portfolios despite slightly higher internal expenses when compared to standard index funds. The historical DFA fund returns have overwhelmingly confirmed this choice, and we believe the process that DFA has in place will continue to support this decision in the future.